If you’ve been told you need a root canal, don’t fear; despite their bad reputation for pain and discomfort, today’s advanced dental technology and sophisticated procedures make the process generally pain-free – similar to what you might experience getting a dental filling instead. So why do people still wince at the thought of getting one? It could be a bad experience several decades ago, or maybe even an association with the pain caused by the infection itself leading up to the procedure. Either way, modern dentistry has come a long way, and a root canal is no longer anything to fear. In this post, we’ll help you better understand exactly why root canals are necessary, what they are, and what you can expect if you need one. The ultimate goal of a root canal is to save a natural tooth root from loss or removal due to infection. An infection can occur when openings in the enamel and dentin allow harmful bacteria access to the soft tissues (pulp) within the tooth. This may occur as a result of decay or because of a trauma that causes a tooth crack or breakage. When bacteria release gases inside the pulp chambers, it can put pressure on surrounding nerves. In some people, this may cause extreme pain and even swelling of the face and neck. In others, the condition goes largely unnoticed, perhaps only causing minor discomfort when chewing. That is why routine dental visits are so important. An x-ray and exam could reveal that what might not seem like a serious issue to you is actually a serious infection that requires immediate treatment. At best, an untreated tooth infection can result in loss of the tooth. At worst, the infection could be allowed to spread within the body and create a life-threatening condition. Believe it or not, pasta sauce is notorious for causing unsightly stains on the porous surfaces of the teeth. It’s easily absorbed into the enamel, leaving an ugly tint behind. Of course, that’s not the only ‘sauce’ that could be changing your tooth shade. Red wine is another notorious culprit, as are other darkly tinted beverages like coffee and tea. If you’re a frequent pasta-eater or wine-drinker, consider a switch to white versions instead. Alternatively, you could make a point to brush your teeth immediately after consuming dark foods (but never before). During a root canal, infected tissue is manually removed from a diseased tooth. The entire process takes between 30 minutes and an hour, and most patients experience very little or no discomfort. 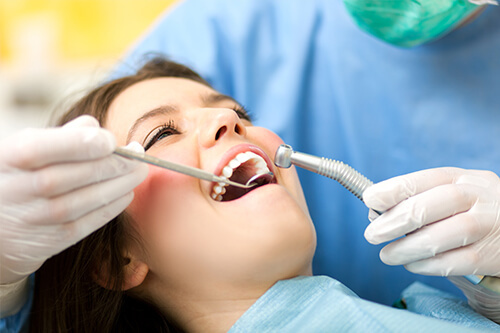 To start, the entire tooth is numbed with a local anesthetic. Some patients may also benefit from analgesic, such as nitrous oxide, to alleviate treatment anxiety and relax without being fully sedated. Next, we open the affected tooth and use very small instruments to begin removing diseased pulp from the tooth canals. Finally, we finish cleaning and preparing the inside of the tooth and fill it with dental cement that is bio-compatible with your body. You may also be fit for a custom crown or other restoration. Most patients can return to normal activities the same day as a root canal, although it’s normal to experience some sensitivity for a few days. If you are experience any of these symptoms, it may be time to schedule an appointment with your Houston cosmetic dentist. Call us today to find out more about root canal treatment and whether it could be right for you.